DEBORAH CROMBIE: Here's a perfect subject for a 4th of July outdoorsy weekend. These days, when teenagers get together to socialize, they hang out--You were going to say "in the mall", weren't you? But that is so old. Now, teens are "hammocking." Or "mocking," as it's called. How fun is this? I would have loved it! 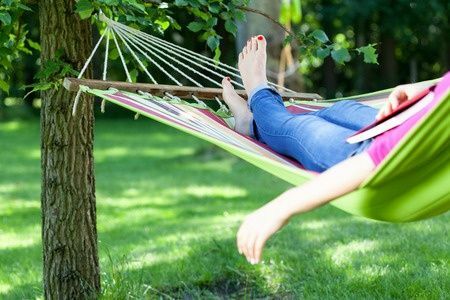 Here's to inventive kids, inventive entrepreneurs, and to National Hammock Day, which is coming up on July 22nd. I hope you all have a cool, hanging out holiday weekend. I might try to grab a few minutes in my hammock (in the morning, when it's relatively cool.) Here's my favorite hammock photo. And because I couldn't resist, these two. How about a REDS hammock retreat? A hammock retreat is a lovely idea! 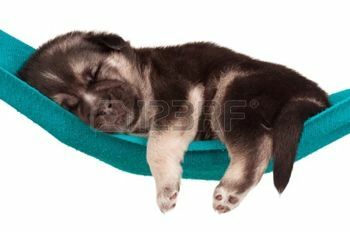 And what a precious picture of the puppy snoozing in the blue hammock . . . .
Our happy hanging out weekend will include a family picnic . . . hope everyone enjoys the holiday. We have a lovely hammock from Costa Rica and I'm ashamed to say I don't know where it is! Note to self- must find and hang. Have a great weekend, Reds and Reds commenters! I'm in, for a hammock retreat! Sounds like the best possible combination of work and play. When I was in Munich last month I visited my daughter's German exchange partner from fifteen years ago. She had hammocks rigged for her year-old son in three different rooms. Must have worked; he was one of the most placid babies I've ever seen. Looks great! But kids in Brooklyn do NOT hammock. No space. That is a little weird. All I can say! I i'm so out of it, though. So grateful that you are keeping us up on the latest trends… :-) But I do love to float in the swimming pool , so maybe it's the same thing? Love the hammocks! What fun! And the puppy? Adorable! No hammock here, but my swing arrived! It's a three-seater, converts to a daybed and has a canopy--so, once I get it together, I'll be doing some gentle swinging and lolling around this weekend! With a good book in hand, and a summer drink. BTW, Karen, I'll be trying the sumac lemonade this summer, too! When I was a youngster my mom's parents had a hammock that was attached to a swing set my grandfather built for the grandkids. Their hammock was plain but comfortable. I think they got it at an Army/Navy store. We grandkids loved it and took turns using it! (There were a LOT of grandchildren!) So funny that it's a "new" craze! I tried a hammock once. It did not end well (for me). So no hammocks here. The Boy is at the pool or walking around the streets with his friends (and some of these are girl-type friends. Ack!). The Girl spends a lot of time in her room (but none of her friends are in our immediate neighborhood). Sometimes she meets them in one or two of the safer/trendy neighborhoods and they roam the stores/shops. Happy 4th! I'm heading for a weekend on my deck, book in one hand, drink in the other. Some writing stuffed in there somewhere. Using a hammock was on my bucket list for years. It looked so restful. Sadly, my weight and my lack of co ordination had me spinning and rocking like a ship in a storm. It took my almost 20 minutes to unhammock.. and yet. I might try it again..perhaps. NOT. I love my hammock. We started with the flat kind, years ago, hung between trees. And that was lovely but I like the one I have now, pictured in the blog above, even better. I can move the stand into the shadiest spot, or I can wrap up like a cocoon if it's a little chilly. It's so comfortable that I don't usually even bother to read. I look up at the tree tops, or nap. It's the ultimate relaxation. FChurch, I love the description of your swing! If I only had a decent sized porch (we have three, but they're all too small to actually spend time there) that's what I would want. There's a Maine company called Penobscot Bay Porch Swings that makes the dreamiest daybed/couch/swings ever. 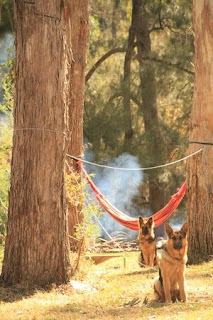 We have come into possession of two good-quality hammocks and are looking for the right places to put them up. I used to love hammocks when I was younger - we'll see how they work with my 55-year-old back now! As for hanging out sites, my older two are already at the sitting-comfortably-on-the-sofa stage. Youngest and her friends like to "snuggle" - when she has girlfriends over, they will drape themselves all over her full-sized bed. Then out come the iPhones and tablets. At her boarding school, the students like to "cuddle puddle" while watching movies in the dorm lounge. They shove two enormous sofas together and everyone climbs into the middle. I was a bit dubious about this because it's a co-ed activity, but Youngest looked shocked when I suggested a large number of teenage boys and girls piled all over each other might be less than wholesome. "Mom! Oh, my God, it's not like that!" Kids these days! Julia, I don't even have a porch at this house. :-( But, this swing comes with a stand, so I can put it wherever I want--the patio, the yard--the canopy is adjustable, too, so you can tilt it to get as much or as little sun as you like. Without a porch, though, I'd have to say that my dream swing would be hung in a rose-covered arbor. You know, the old roses with a perfume to make romantics of us all! 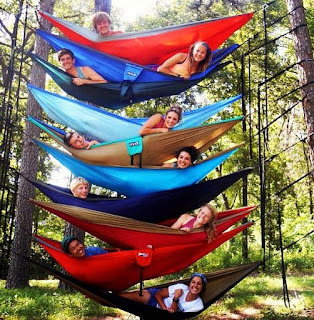 What a cool thing for young people to do, hammocking. I think my two granddaughters would enjoy a hammock. Will have to pass that information along. 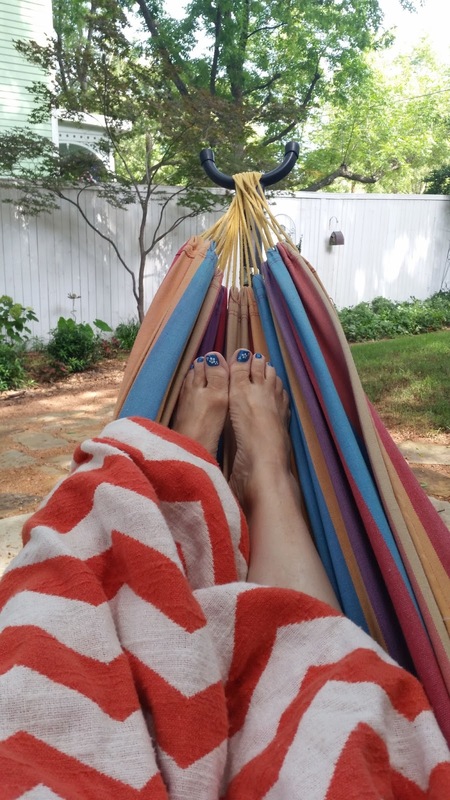 Debs, I love your hammock picture with your pretty blue toes. And, the doggie pictures are great. Unfortunately, I can only imagine it ending badly if I were to try to use a hammock. FChurch, your swing sounds more my style. Happy 4th of July everyone! We had our first celebration last night going to daughter's house and cooking out. It ended with younger granddaughter reading to me, so perfect evening. And fun to see groups of students hammocking around the App State campus. Donald got a Kammock for Christmas and it's going to the beach with me next week for the Girls' Week at the Beach Retreat. Yay, Hank! So glad I was helpful! You'll have to let us know if he likes it. Here in Portland, where you'd expect this to be a big deal, (lots of trees, hip town), this doesn't seem to be a thing. The backyard pool is still tops, followed by the river, as hang out spots. Especially at our next door neighbors house, where they have had a noisy pool party every day since school got out, three weeks ago. Two teen daughters have no sense of consideration for the rest of us. Grrrr. No hammock here, and I know bupkes about what kids are doing these days. However Jules and I have been hanging out in the garden all day in our zero gravity chairs. The weather is perfect, low seventies and no humidity. Come on over. BYOH. (Bring your own hammock). Adult beverages provided. Debs, I loved our hammock in the woods. I slept in it all summer when I was a kid. 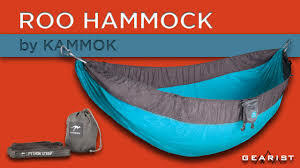 The first time it rained when I was sleeping out, I cried so much my mother got someone to give her a hammock that had a roof and mosquito netting. He said he got it in the army??? That's what he said. I think it was code for something else.